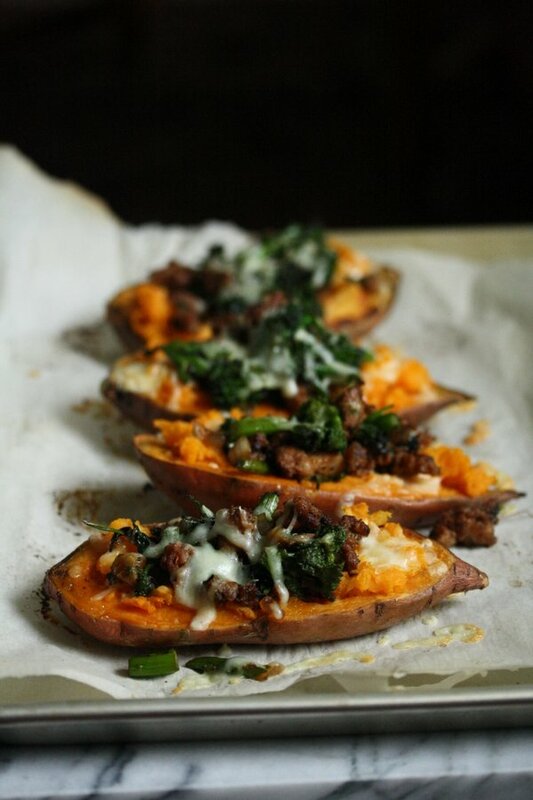 Baked potatoes always remind me of being 13 in the back woods of Vermont. Unlike most of my friends, I opted for a less traditional camp experience. Instead of learning the merits of Color War mascot design or how to flat iron your hair after a day at the lake, my camp had ponies and chores and non-Jewish girls. At horseback riding camp, we rose every day at 6am to get the ponies from the paddock. We slept in tents and had to sometimes hike ½ a mile to use the bathroom “facilities,” unless you wanted to pop a squat outside in the middle of the night. And care packages were strictly prohibited, which made sense, considering all it took to ravage our living quarters was one precocious raccoon who understood the concept of Velcro. The food at Camp Catherine Capers was exactly what you’d expect. My most distinct memories are of the chocolate chip pancakes we got on Saturdays, which was the closest thing we ever got to sanctioned dessert. Our candy cravings were so great that the uber Catholic camp directors took to coercing the campers into attending church on Sundays by promising a dollar reward that could be spent at the penny store on black raspberry ice cream or 100 pieces of Sour Patch Kids. Obviously, without hesitation, I embraced Jesus for Jelly Beans. 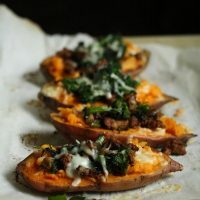 Besides the Sunday candy and the McDonalds we got to inhale on the way home from horse shows (neither of which I was allowed to eat at home), my most vivid food memories revolve around what we ate on our camping trips. We’d load up the horses with saddlebags packed with a week’s worth of dried soup and Capri suns and take off for a remote resting spot a few towns over. For the longer trips, we’d spend our nights at a few makeshift camping sites along the way, until we reached our main destination with a trailer full of supplies waiting for us. 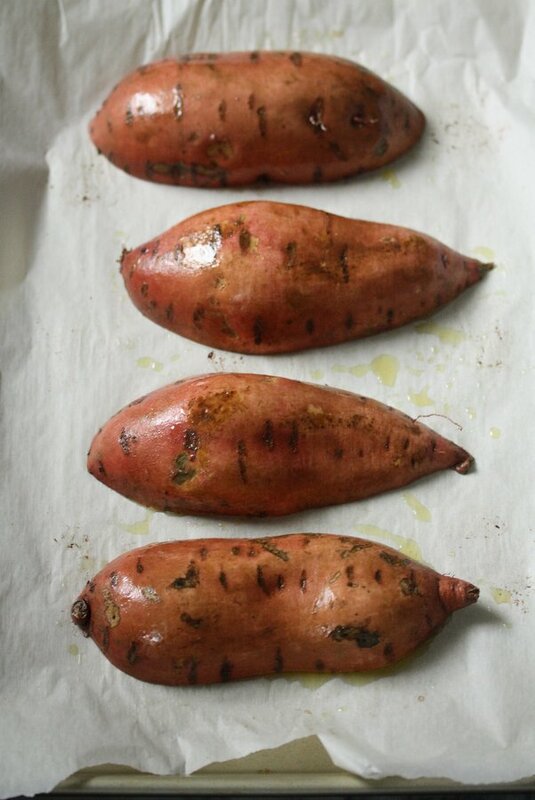 On these nights, aside from the Cup-o-Noodles, we’d eat things that didn’t require any cooking equipment, which meant baked potatoes wrapped in foil. It’s kind of embarrassing to admit, but until a few weeks ago, I had never attempted to make a baked potato in my kitchen. To me, it was something meant to be eaten straight from the bonfire, sitting on a stone, with so much delicious steam emanating from the foil, you might temporarily forget that your clothes smelled like manure. 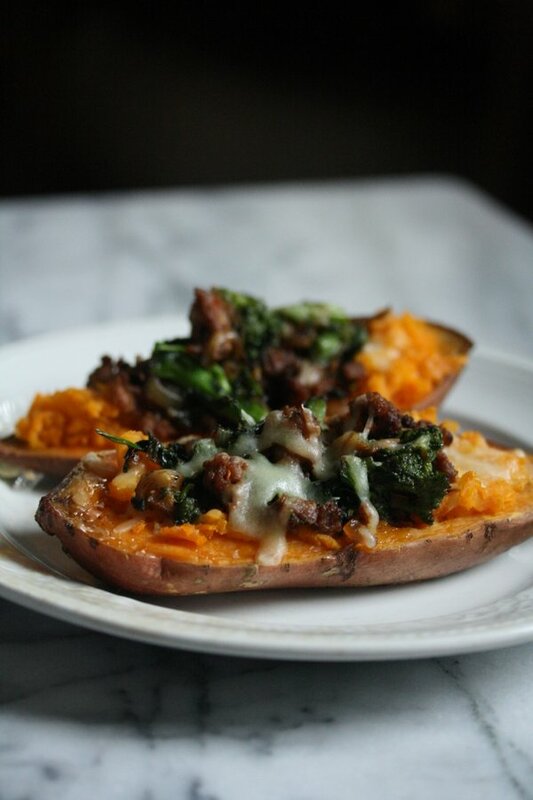 But in the spirit of last minute low-stress Thanksgiving dishes, I thought I’d try out a healthy baked sweet potato with spicy Italian turkey sausage, broccoli rabe, and the requisite shredded cheddar cheese from my childhood. 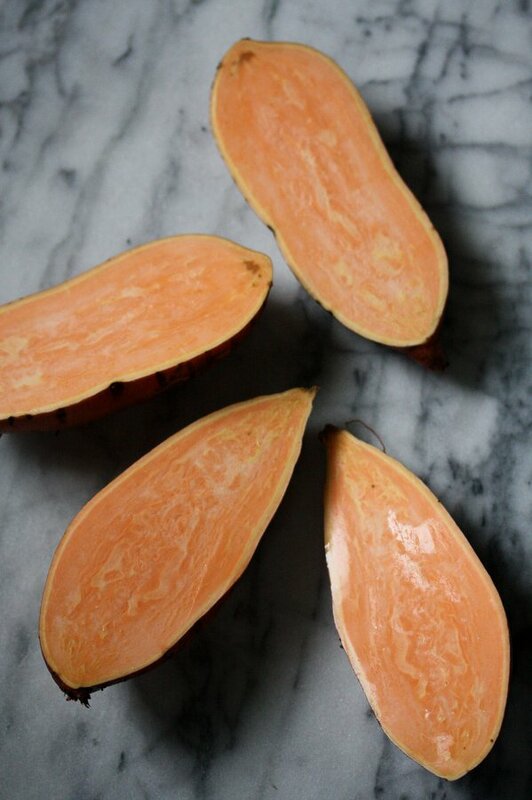 If you’re cooking for 4 instead of 40 (like I will be), it’s a great easy side to add to the holiday table. 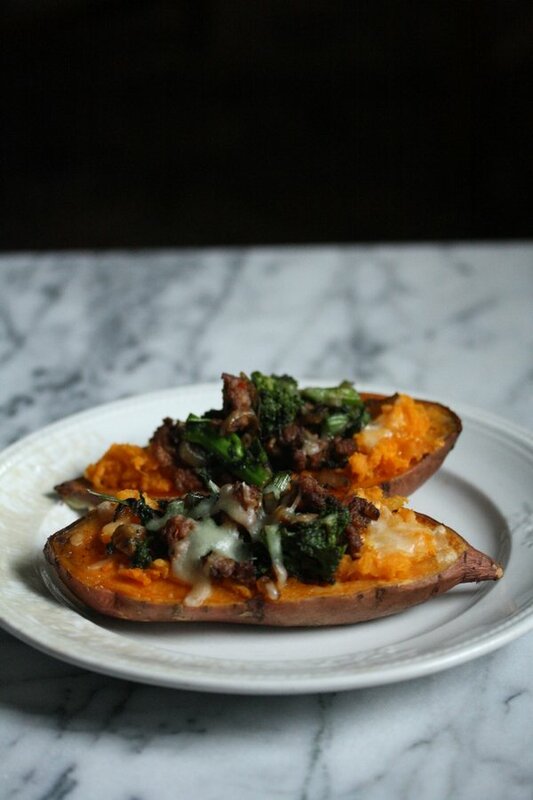 A healthy baked sweet potato is also a great vehicle for leftover turkey. 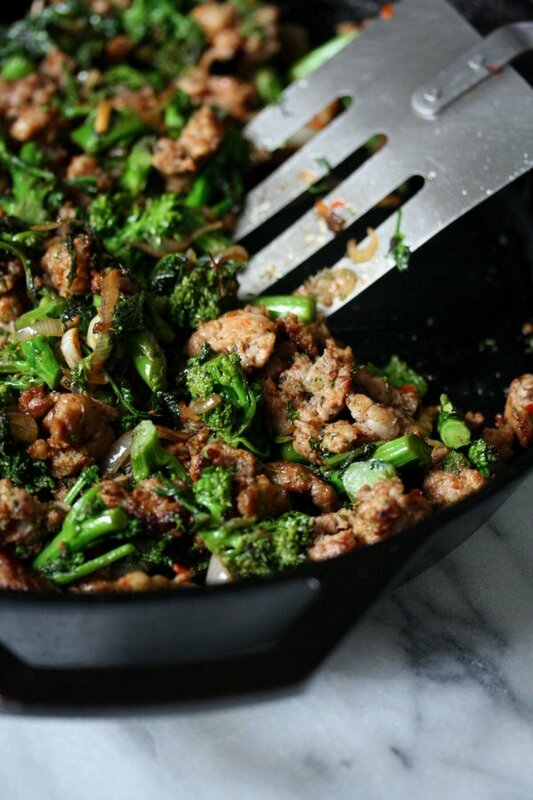 Simply swap it in for the sausage and add some recycled sprouts or stuffing for a delicious morning-after meal. For more last minute ideas, click here or here. 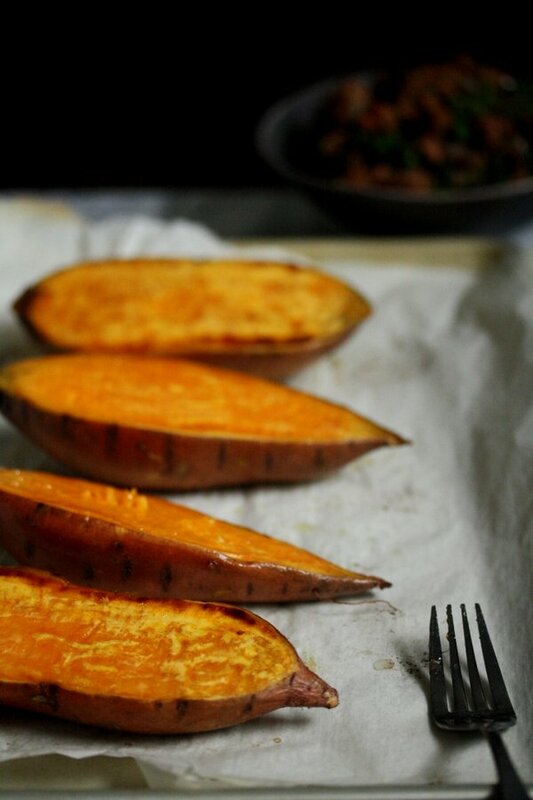 Cut the sweet potatoes in half lengthwise. 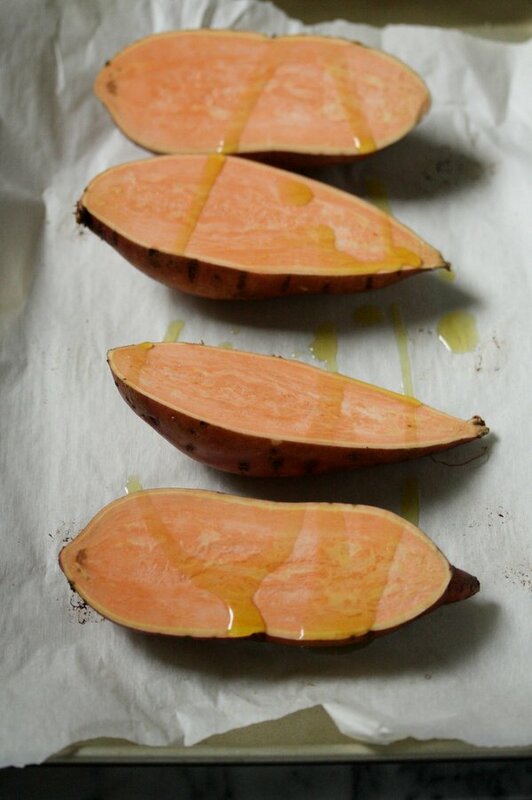 Brush with olive oil and place face-side down on a parchment-lined baking sheet. 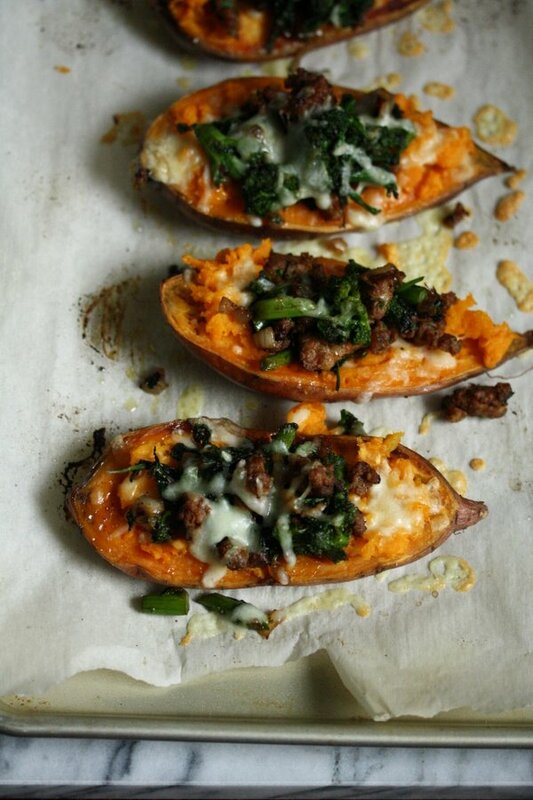 Bake until fork-tender, about 25 to 30 minutes. Set aside until cool enough to touch. Meanwhile, 1 tablespoon olive oil in a large cast iron skillet. Brown the sausage over medium-high heat, breaking it into pieces with your spatula, until cooked through, 5 minutes. 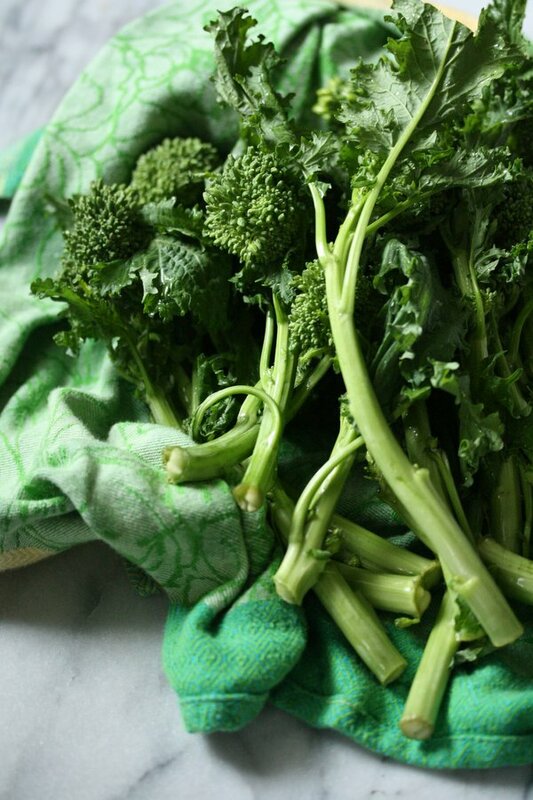 Add the shallots and broccoli rabe and cook, stirring occasionally, until soft and lightly charred, 5 minutes. Add the garlic, paprika, and salt. Cook one minute more. Remove from heat. 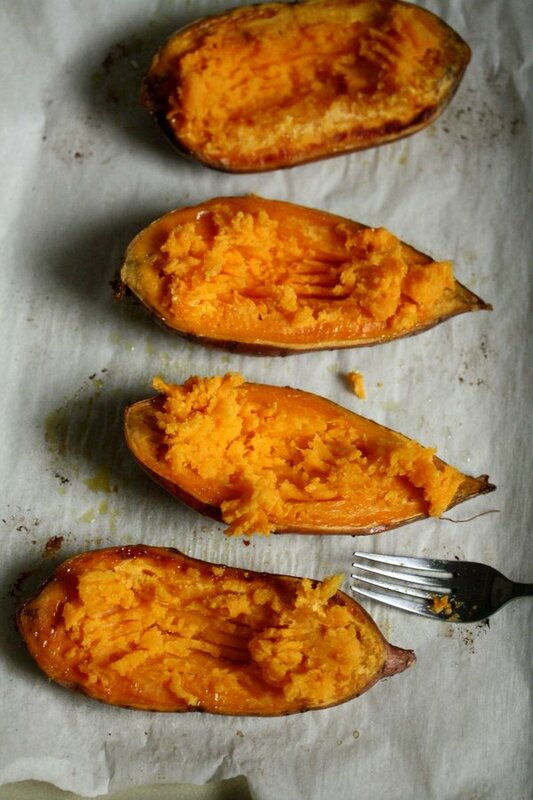 Using a fork, carefully fluff the center of the sweet potato, creating a well for the filling. 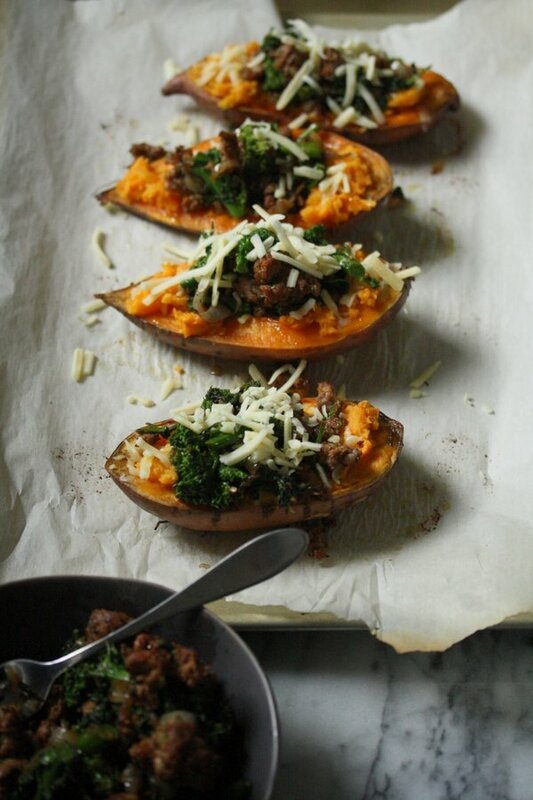 Sprinkle each sweet potato with 1 tablespoon of the cheese. Divide the sausage mixture between the potatoes, gently patting the filling into the center of the well. Top with the remaining cheese. 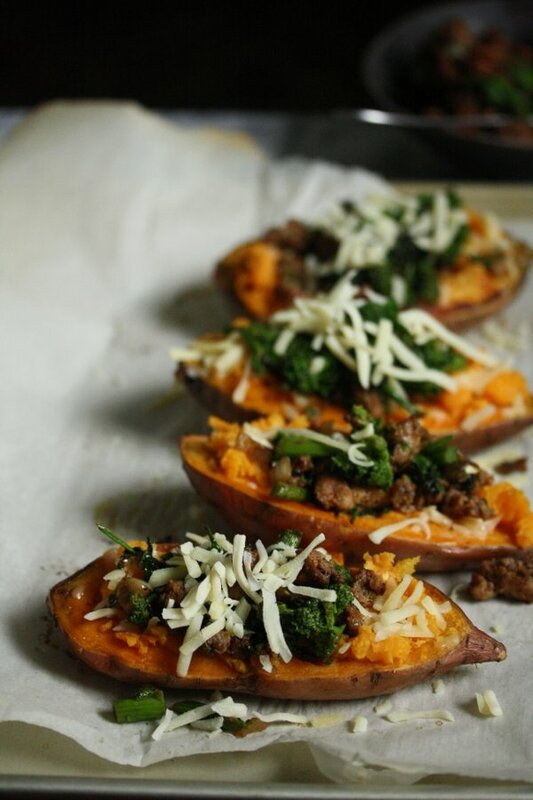 Return the potatoes to the oven until the cheese is melted and beginning to brown, 5 to 10 minutes. Serve immediately. This piece is such a hoot. 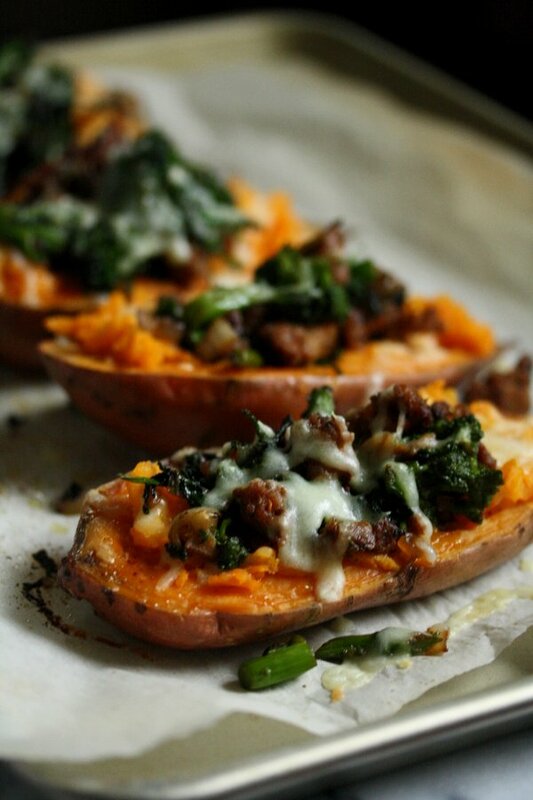 Made this for dinner tonight and it was sooooo delicious and easy. I’m going to pass the recipe along to my kids, they’ll love it. I’m so glad Georgia!! Thanks for making! yahooo! let me know how it turned out!